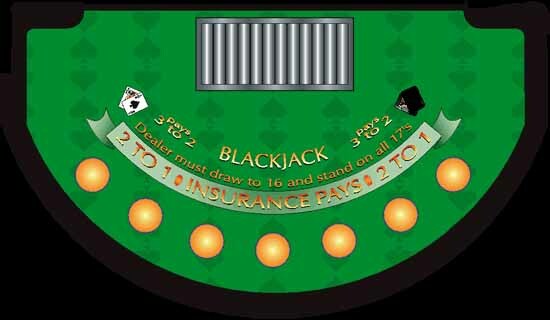 The objective of Blackjack is for a Player to come as close to 21 without going over, while still having a higher total than the Dealer. Prior to receiving any cards, the Player must place a bet. Once the bet is made, the Player is dealt two cards face up. The Dealer is also dealt two cards. If the total value of the Player's cards is closer to 21 than the Dealer, the Player wins as much as was bet. The Player also wins if the Dealer goes over 21 and the Player has not busted. If the Player's total goes over 21, the Player loses the amount bet. Blackjack is dealt with 1 to 6 decks of cards. Cards are normally re-shuffled after each hand. Aces can count as either 1 or 11 whichever is more advantageous. Bet - To place a bet, the Player must place a in the circle in front of them. Deal - Once all bets are placed the players get two cards face up and the Dealer gets two cards. Double - When a Player has been dealt the first two cards and believes that the third card will give them a position to beat the Dealer's hand, they can "double down." The bet is doubled, and one additional card is dealt to the Player. 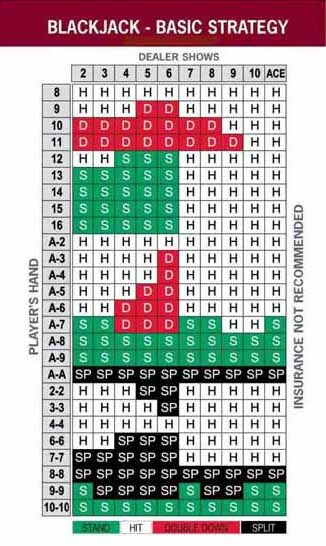 The hand is automatically stood, and the Dealer then completes their hand comparing it to the Players' total. Blackjack - Is achieved when first two cards total 21. Standard casino party payout is 2 to 1. Blackjack beats a score of 21 consisting of 3 or more cards. Bust - Is achieved when total value of cards for either the Dealer or the Player exceeds 21. If the Player busts the bet is lost, if the Dealer busts the Player wins the bet.